The tale of the murphy bed has proven to be the worst/most interesting accident to happen to us since we got this house. The fact that this is the worst story we have to tell makes me thank my lucky stars that nothing else too horrible has happened. Although, there was that one time Matt almost electrocuted himself up in our attic – but that never caused him any real damage other than a near heart attack. We can now look back on this story and laugh. Because – it is rather amusing. If you remember from my first post I had mentioned a murphy bed was in one of the bedrooms when we bought the house. 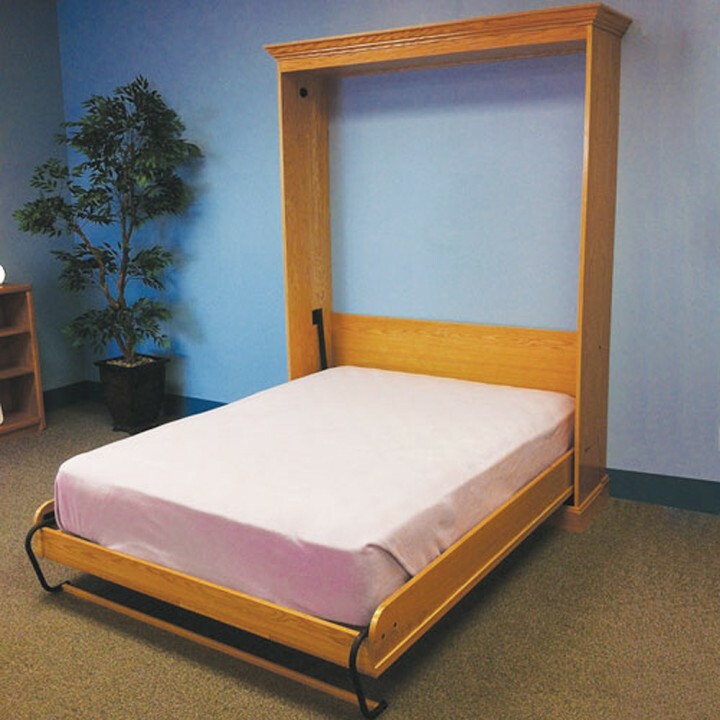 This murphy bed was a bit strange though – instead of lifting up and fitting INSIDE the wall – it was screwed to the wall and so part of it stuck out when closed. It was also freakishly close to the bedroom door, so it was if you were going to bump into it when entering the room. But bigger, heavier and uglier. And bolted to the wall. One random weekend before we had moved in, we had gone over to the house to get the floors ready to be finished. With Matt’s cousin Phoebe in tow – we headed over to the house to pick staples out of the floor. Yes, not only had the previous owners stapled a big piece of forest wallpaper to a bedroom wall – they had also stapled the carpet into the hardwood floors. This was one tedious task and I would wish it upon no one. As Phoebe started in the forest wallpaper room and I in the living room, Matt decided he was going to go into the other bedroom and take the murphy bed off the wall. He had taken the screws out of nearly every part of the bed and was straddling the last post attached to the wall and the bed frame (which was down) when the entire thing collapsed. Phoebe and I both jumped up to see what had happened. As I ran into the bedroom I found her struggling to lift the post off of Matt’s thigh. He was pinned between the bed frame and wall post. With the strength of a thousand mother’s, I quickly grabbed the post and lifted it with ease. As he moved his leg out from underneath I let it fall to the floor with a thud. Later I recall trying to lift the frame out of the room to take it to the dump. For the LIFE of me, I have no idea how I could’ve possibly lifted this thing. Adrenaline is a funny thing. Some people lift cars off people, I lift murphy beds off my boyfriend. 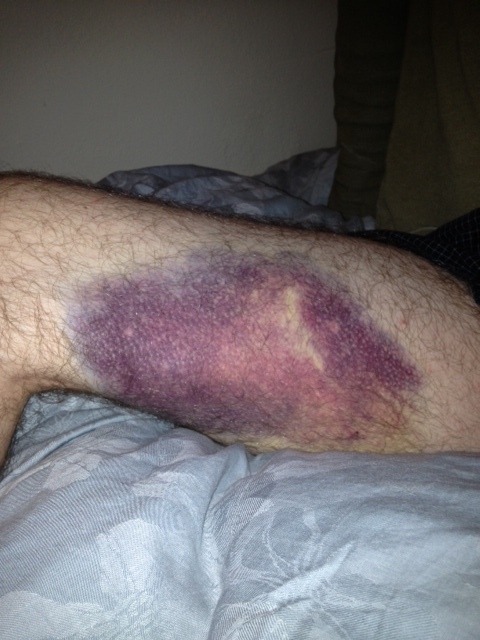 Matt’s thigh later that night. Luckily, he was fine. Nothing broken or really damaged. Although to this day he still has a dent on the side of his thigh where the frame had him pinned. 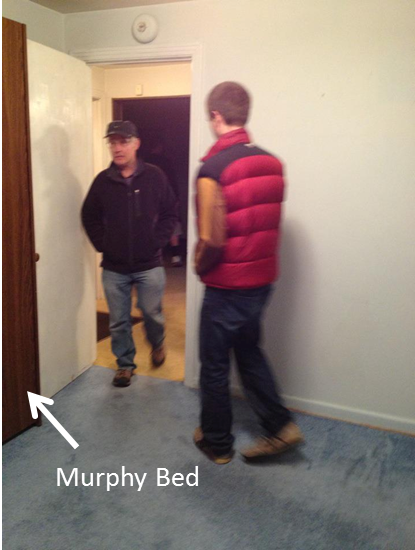 Moral of the story – don’t try unscrewing murphy beds from walls alone. Or maybe even at all. At least have someone holding things up while you take them off the wall. I could only imagine what could’ve happened if we hadn’t been there.